By Louis Jacobson on Wednesday, January 16th, 2019 at 10:42 a.m.
We recently asked readers what they wanted to know about the government shutdown. Now, we offer some answers. In this installment, we’ll tackle questions about missed work and pay. We’ll address additional topics in the coming days. What agencies and departments are completely shut down? The departments affected by the partial shutdown because their spending bills expired are Agriculture, Commerce, Homeland Security, Justice, parts of Interior (such as the Bureau of Reclamation), State, Transportation, Housing and Urban Development, Treasury and NASA. A wide range of independent agencies are also shuttered, including the U.S. Trade Representative, the Consumer Product Safety Commission, the Federal Communications Commission, the Federal Trade Commission, the National Archives and Records Administration, and the Smithsonian Institution. What departments and agencies are open? Some departments have valid spending bills in place, so they are operating as normal. They include: Defense, Labor, Health and Human Services, Education, Energy, the Army Corps of Engineers, Veterans Affairs and the Nuclear Regulatory Commission. What is the total number of employees affected by the shutdown? The shuttered federal departments and agencies employ more than 800,000 people, or roughly 40 percent of the federal workforce. They include workers in all 50 states, according to a Washington Post analysis of data from the federal Office of Personnel Management. These 800,000 employees fall into two categories. About 380,000 of the have been furloughed, meaning they cannot come to work and are not being paid. Another 420,000 aren’t being paid, but are required to remain on the job. These include many officials in law-enforcement and homeland security, such as Customs and Border Protection and the Coast Guard. How can the government force employees to work without pay? This is under legal challenge. Todd Dickey, an assistant professor of public administration at Syracuse University, recently wrote in the Washington Post that two laws are in conflict: the Antideficiency Act, the nineteenth-century law that addresses what should happen if government departments run out of money, and the Fair Labor Standards Act, which among other things set a minimum wage. In one closely watched case filed by two labor unions, U.S. District Judge Richard J. Leon on Jan. 15 refused to require that the government pay federal workers currently working without pay, writing that it would be "profoundly irresponsible" to risk these employees simply staying home. "At best it would create chaos and confusion," Leon said. "At worst it could be catastrophic . . . I’m not going to put people’s lives at risk." Dickey also noted that two federal prison employees and their union filed a class-action suit seeking pay and damages, and subsequently, two Customs and Border Protection officers filed suit as well. How often are government employees paid? The federal government issues employee pay on a biweekly basis. A pay period is typically 80 hours of work. Since the beginning of the shutdown, how many checks have been missed? 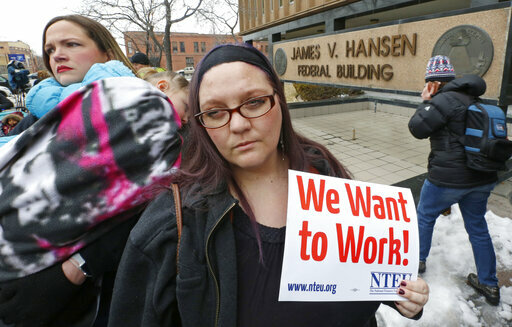 So far, federal workers have missed on one paycheck, on Jan. 11. When the government opens again, will the people who stayed home get paid for days they did not work? There is no requirement that federal employees be compensated for workdays lost due to a shutdown, but Congress and the president have historically repaid lost income. The House has already cleared a bill to ensure back pay, as well as guarantee payment for employees affected by future closures. The Senate has not acted yet. What is the impact of the shutdown on government contractors and vendors? Unlike federal employees, contractors have no history of pay being restored. There are an estimated 4.1 million people working on federal contracts; it’s not clear how many of them have been sidelined by the shutdown. Is Congress getting paid during the shutdown? Congress is still getting paid because they already passed the spending bill covering the legislative branch. That said, however, some individual lawmakers have pledged to voluntarily turn down their paychecks. What is happening at the national parks without the protection of the park rangers? The National Park Service is being hit by the shutdown, and all parks are affected to one degree or another. Many are open but with limited access and staffing. This has at times created messy situations due to lags in maintaining facilities. Vandals cut down some of Joshua Tree National Park’s trees, and park users created new trails for off road vehicles. It’s unclear whether there are any other cases of irrevocable damage. On Jan. 6, the National Parks Service announced that it would use funds collected from park fees to clean up trash, clean restrooms and bring law enforcement rangers into parks. What is the status of the Internal Revenue Service? What is the effect on tax returns? This is still a work in progress. On Jan. 15 — exactly three months before the annual due date for tax returns — the IRS announced that it would bring back tens of thousands of employees under a new shutdown plan, but the auditing of returns would not be supported. Also closed: every Taxpayer Advocate Service office. That’s the office where people turn when they can’t resolve a dispute with the IRS, or they have a personal situation that will get worse if the IRS doesn’t move faster than usual. It helps about 200,000 taxpayers each year, out of more than 100 million returns filed annually. Officials said that the tax refunds would be sent despite the shutdown, though if that happens, it would break with precedent.